Hidden Figures tells a kind of story that has become overly familiar—how black individuals managed to achieve in a system built to oppress them—but does it in a different way. 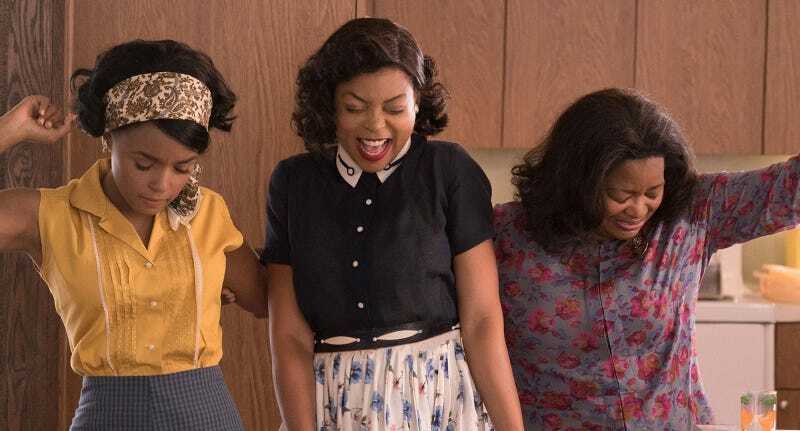 Widely released to theaters this past weekend, Hidden Figures shines a spotlight on the heretofore unheralded contributions of three African-American women to NASA during the crucial days of the Space Race in the early 1960s. Taraji P. Henson plays mathematician Katharine Johnson, whose prodigious mind let her perform complex calculations from a very early age. The film also chronicles the stories of programmer Dorothy Vaughan (Octavia Spencer) and engineer Mary Jackson (Janelle Monae), who all found themselves working separately and unequally from their white peers. Based on the book by Margot Lee Shetterly, Hidden Figures hews to the conventions of the Portrait of Dignity subgenre in the Black BioPic genre. It shows black people with singular talents held back by the racist mores and individuals of the day, digging deep in reservoirs of strength and forbearance to create historical moments that move all of America forward. One powerful recurring beat in the movie shows Johnson having to run across the Langley campus in Virginia to use the segregated bathroom that’s 40 minutes away from her desk. It’s reminiscent of moments like the fraught, illegal walk to a water fountain in 1974 TV movie The Autobiography of Ms. Jane Pittman. Hidden Figures tells a story that absolutely needs telling, no doubt, but I’d seen its ilk before. It uses the Civil Rights Movement as a backdrop and there’s a predictable mix of hostile, clueless, obstructive and brave, defy-institutionalized-racism white people who represent both the inertia of social attitudes and fitful social progressivism of the times. I expected a warm, resonant tearjerker with no real drama to keep me in suspense. We know how most of the arcs in the movie will end, after all. But director Theodore Melfi and the other filmmakers make a point of making the women’s personalities differentiated so that they don’t get read as an indistinguishable lump. Jackson is feisty in the face of condescension while Vaughan masks her simmering anger at getting passed over. Johnson is portrayed as quieter than either of them—with the exception of one emotional outburst at boss Al Harrison (Kevin Costner)—but her talent is such that her intelligence can’t be ignored. The women metaphorically embody the different ways—direct confrontation, subversively making oneself indispensable and sheer genius—that black folks fought for civil rights and equal opportunities throughout American history. What’s more, Hidden Figures doesn’t shy away from the sexist dismissals from the black men in the women’s lives. One of my favorite scenes showed between Mary Jackson and her husband, Levi, who’s wary of her potential for advancement. His words are couched in a desire to protect her from being gullible but there’s an undercurrent of his feeling threatened by any gains she might make. Similarly, Johnson’s first interactions with her future husband have him being surprised that a woman could do the work that she does. These instances put the lie to any notions that all black people just marched happily together during the Civil Rights Era. I like that Hidden Figures shows that the three main characters had lives outside of their encounters with racism. Katharine Johnson is shown as more than just a prodigy; she’s a widowed mother rediscovering romance, for example. In a time before personal computing was ubiquitous, Johnson and her peers were called computers, a term that sounds dehumanizing and mechanical to our modern ears. Hidden Figures reminds us that these black female computers were always human beings, even if they weren’t treated as such by the people whose lives they helped change.